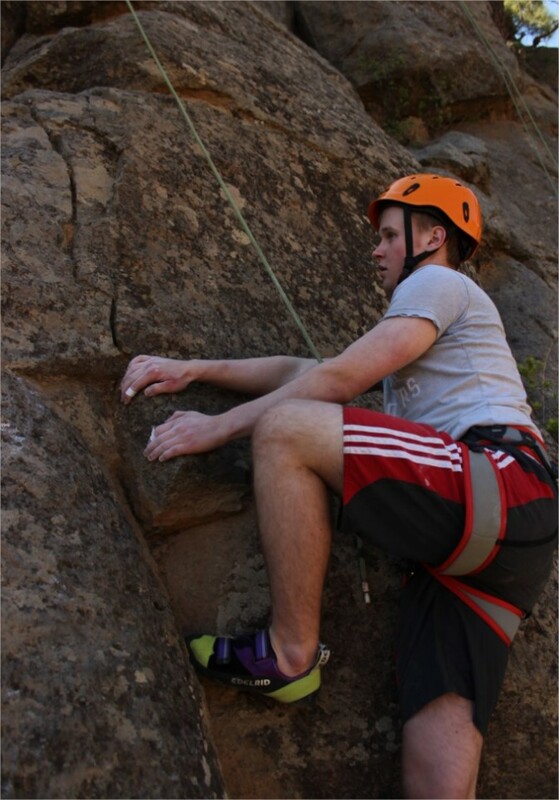 Royal Belfast Academical Institution CCF deployed 9 Senior Cadets and 2 Officers for a rock climbing exercise in Tenerife on 16 – 23 February 2016. This exercise had been months in planning and everyone was delighted to finally receive full clearance. It would mark the first ever overseas AT Exercise for the Contingent and one of the few every undertaken by Cadets in 38 (Irish) Brigade. Tuesday 16 February heralded the transit day from Belfast International Airport to Tenerife South. It was an early start at 0630 hours with a flight time of approximately four hours. After some delay in collecting the hire vehicles the Ex party made their way to Santa Cruz, the island’s capital, to book into the hotel, after battling with driving on the right and the island’s drivers! Wednesday 17 February was the first rock climbing day and the whole party were straight into business, departing the hotel at 0800 hours followed by a few minutes of shopping for the day’s provisions. The area targeted was ‘Arico Arriba’, near Villa de Arico. This is the most popular area with a selection of over 200 routes up to 8c. 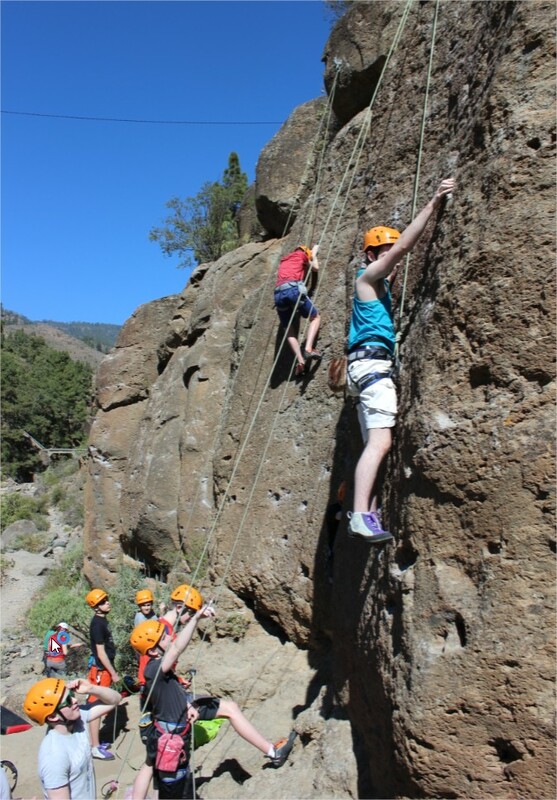 The routes are situated in a dry river gorge with stunning scenery. The routes selected to warm up were up to V+ and were bottom roped. The Cadets were straight into climbing mode, helped by the many weeks of pre-training conducted on the School’s climbing wall. By this time the cadets were warmed up and ready for some friendly competition between themselves and the Major. With hands chalked and feet primed, the Major scampered up the rock face chasing the escaping sunlight to produce a very impressive time. However, the cadets fought back at the Officers with Freddie Johnston halving the Major’s time in becoming the fastest climber of the day. With the day coming to a close, the cadets had had enough of ropes and decided to swap their harnesses for the crash mat and took on some difficult bouldering problems. 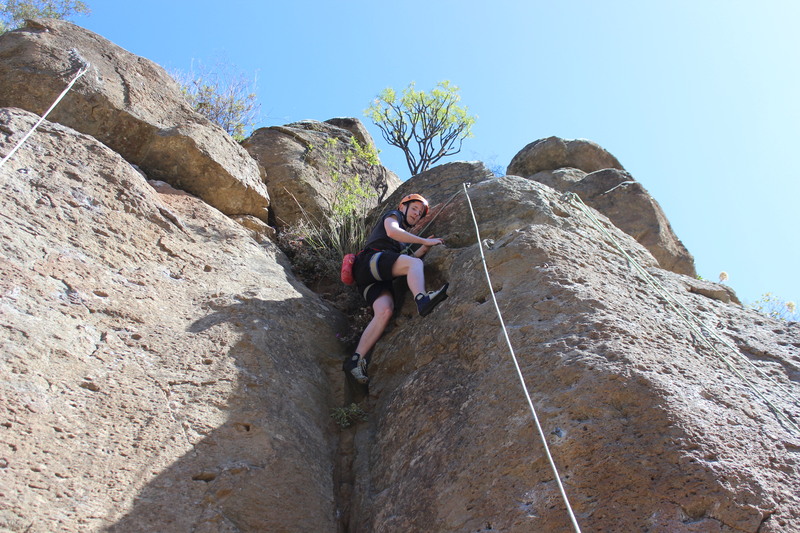 We started the problems off with a challenging traverse across a sharp piece of basalt. 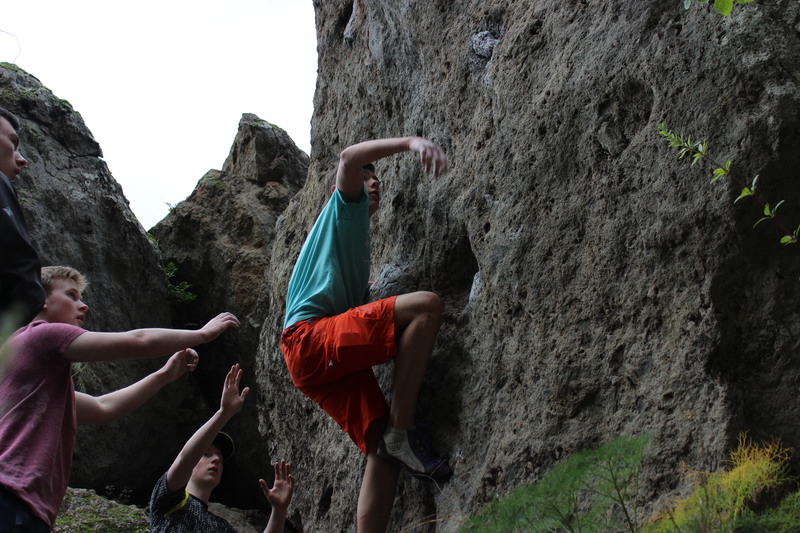 All of the cadets attempted this problem with Mark Greer getting the furthest along the traverse using some impressive footwork and upper body strength. 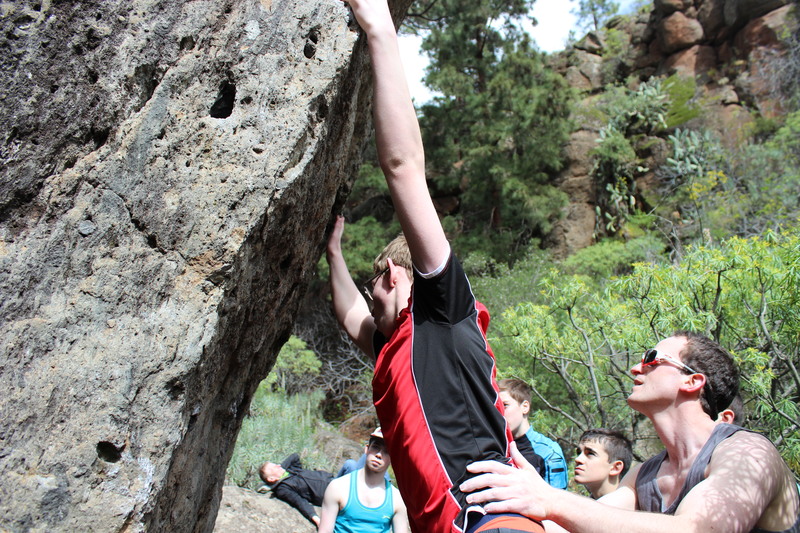 The final boulder problem involved a difficult overhang with poor hand holds. This problem proved to be too difficult for any of the cadets or officers to complete with some of the cadets vowing to conquer it by weeks’ end. The next few days were beset with rain with an unseasonal storm blowing across the entire Canaries, however we were determined to achieve something. 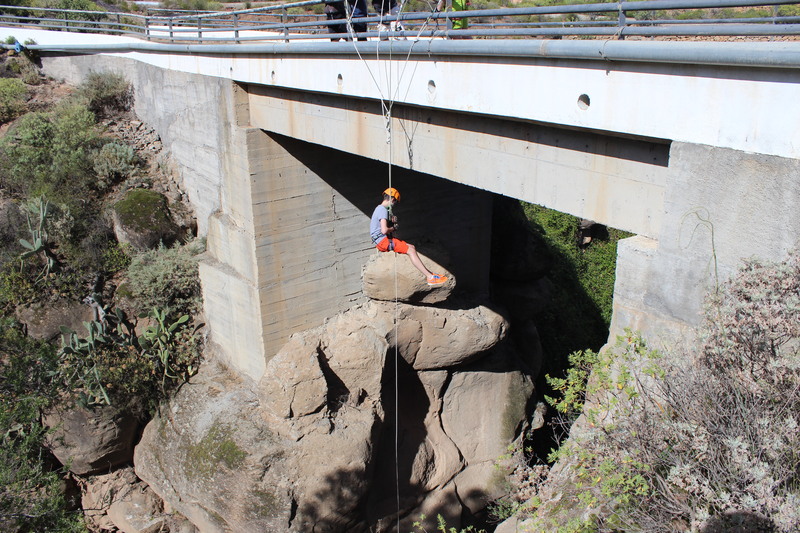 A combination of abseiling from the road bridge in Arico, a half day of climbing on wet (grim) rock, driving up the mountain to the snow line at around 1500 metres, and indoor climbing kept everyone well occupied and out of mischief! As we woke up on Sunday we were surprised to see sun as it had been raining around the hotel for the past few days. We had all of the gear ready the night before and set off to Guaria. For once the weather forecast was correct and it was the warmest day we had on the island, reaching 26°C, which had prompted us to purchase plenty of food and water. The walk up to the climbing area was definitely a good warm-up for climbing as all of the men had broken a sweat. 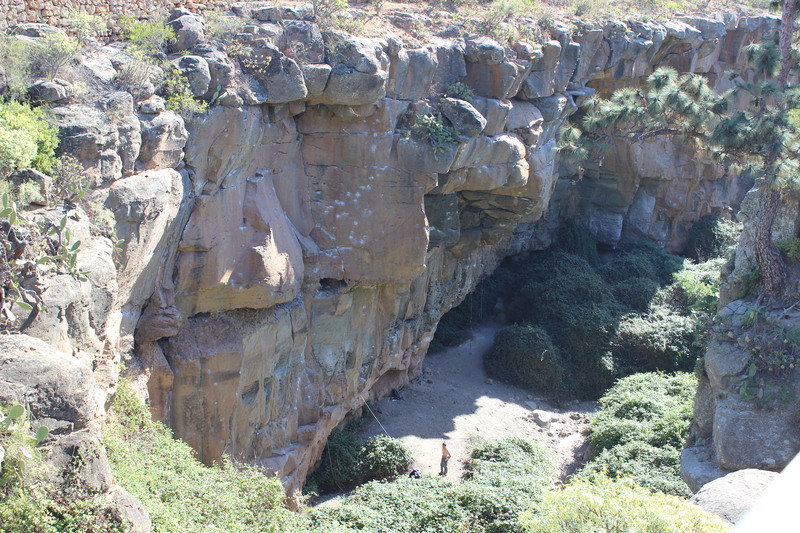 When we reached our area we found a cave where we put up sun protectors to shield the men from the very hot sun. 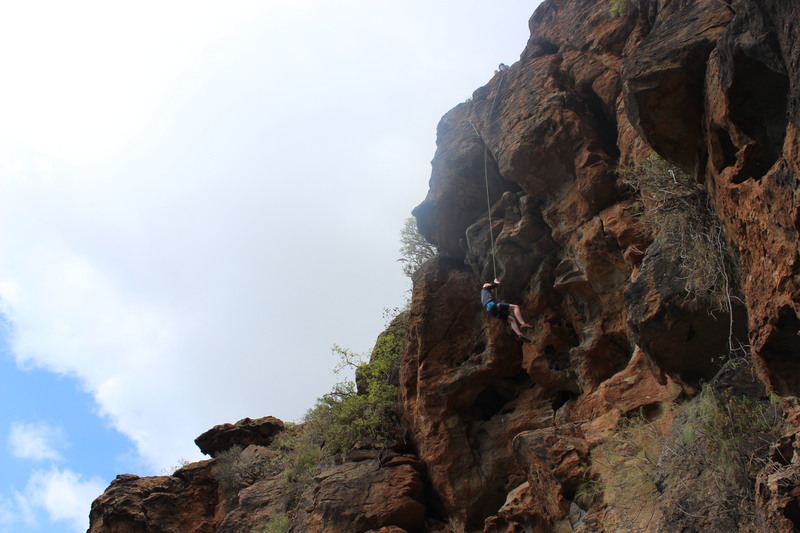 The first climb of the day was on top rope with the belay at the top of the crag. This was definitely out hardest climb yet, at grade 6c+ and a vicious four-foot overhang, no-one completed this, but it was extremely enjoyable; especially when swinging out from the rock after pinging off. We decided a few easier climbs would be the way forward and a way to keep spirits up. There were a few other climbs which were slightly easier as they did not have the overhang. Monday marked the final climbing day and a tangible determination to get many more hard routes completed. Following another early breakfast, the party went out again to collect provisions, this time visiting a deli to collect a range of very delicious fresh filled baguettes and pastries. 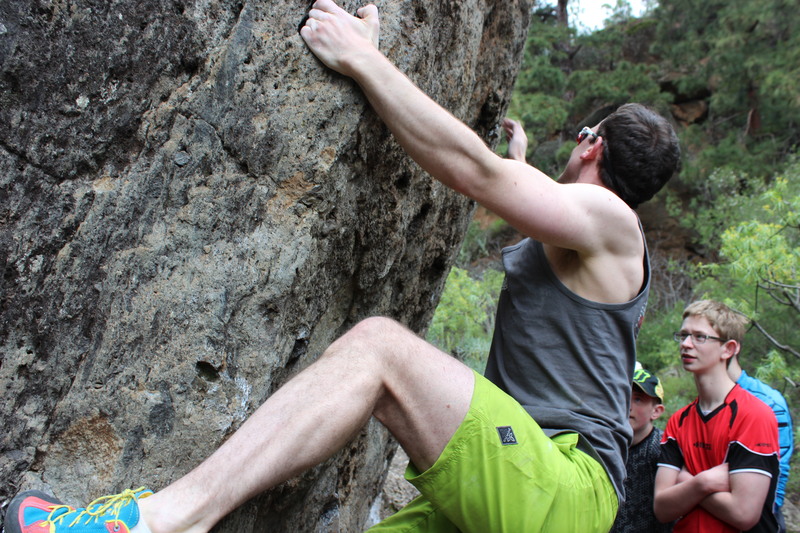 We headed back to the much loved ‘Arico Arriba’ and got stuck in to new climbs, ‘Los Quintos’ had a good range of climbs ranging from a V- to 6a which catered for the different levels of climbing ability. While the men and Mr. Shields enjoyed a solid morning of climbing, the Major lay up on his perch on top of our bouldering mat soaking up the sun. Wishing to push even further the group split into two in the afternoon, half going to ‘Sus Villa’ sector for more roped climbs and the other half returning to the previously failed boulder problem. The completed climbs of the day included a 6b+ route. Unfortunately, none of the Cadets could conquer the boulder, graded 6c, but Mr Shields managed after many attempts and frustration. A final dinner was held in the hotel, a three course meal which hit the spot! 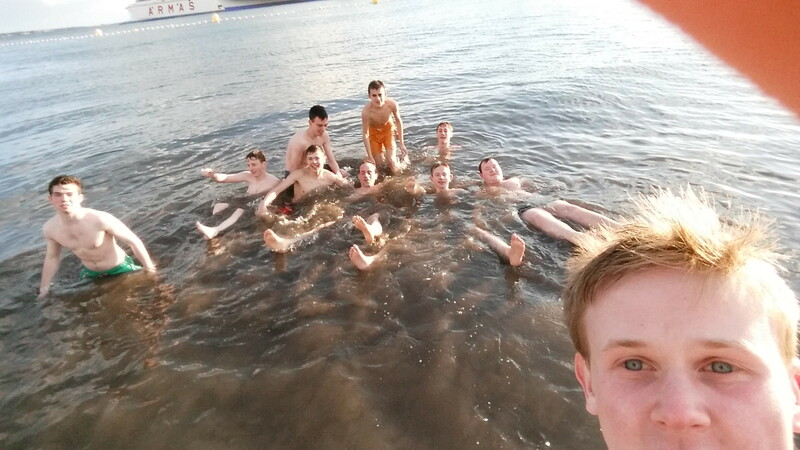 The final day was sold as a boring return however we were surprised when a quick visit to a sunny beach at Playa de Las Americas was on the cards! After this we returned to the airport, booked in and said farewell to Tenerife, with the full intention to return someday; maybe even finish that boulder problem. As the inaugural AT Exercise of the Contingent it had the aim of reinvigorating the senior Cadets and also to improve retention. It has certainly met and surpassed this aim, with the Cadets all wishing to take part in an annual event and try out a range of sports. We are exceptionally grateful for the Ulysses Trust supporting the Exercise, without their support a number of boys would not have been able to attend due to the cost. Written with contributions from all the Cadets who attended the Exercise. 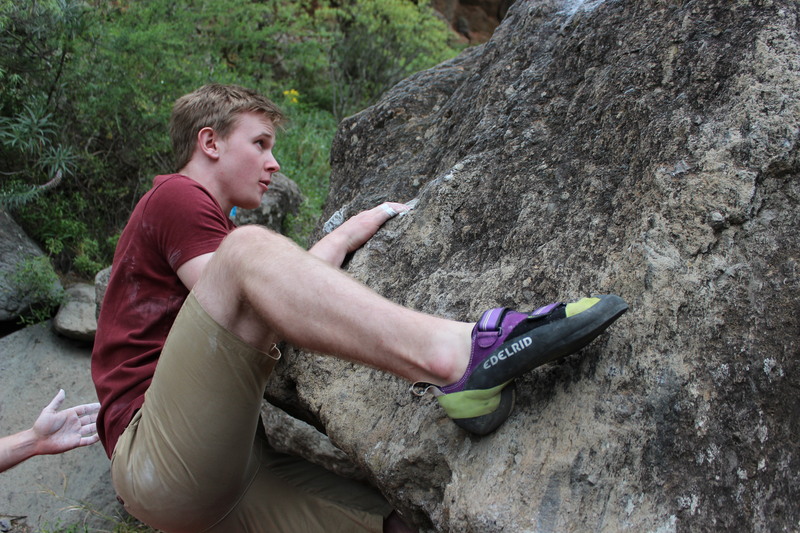 Cadet Corporal Greer dynoing up El Africana, 6a. Cadet Under Officer McKee, determined to top out. Cadet Corporal Johnston getting into traverse. 2Lt Shields detailing the traverse route. Cadet Corporal Greer starting the ‘long drop’ to the gorge floor. Looking into the gorge at Arico. Cooling off after a week of tough climbing. Cadet Sergeant Kirkwood on the cruz move of Pa’empezar, V-. The Cadets warming up on hot rock in full sun. Cadet Under Officer McKee laybacking up Pacca, V.